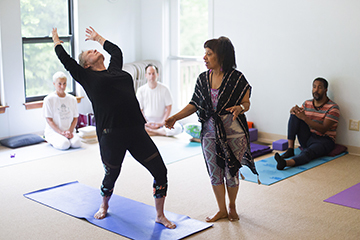 The timeless practices of Yoga help practitioners to age agelessly—maintaining the energy, strength, and keen perception of their younger years. Ever-youthful yogini Barbara Prema Brown will guide you in this Yoga workshop for those who want to turn back the clock. Learn how to cultivate beauty and youthfulness inside and out at any age. Aging Agelessly at Yogaville turned out to be the most relaxing mini-vacation of my life. The class was fun and most informative. Yogaville is not only beautiful but a peaceful retreat. All who work or volunteer are truly there to serve. If ever you have an opportunity to take this program with Prema, I urge you to do so.